Any professional, practice and occupational healthcare professional who is involved in carrying out spirometry or wanting to carry out spirometry in any setting. This fully comprehensive training course aims to equip attendees with the background knowledge and skills necessary to prepare for a spirometry test, how to carry out a test as well as how to handle pitfalls in the testing process and assess the quality of the data collected. This course is appropriate for those who have some or much experience in spirometry as well as those who have never used a spirometer. Successful completion of both theory and practical examinations as well as a portfolio of evidence will result in the learner being awarded a Certificate of Competence in Spirometry at NQF level 5 as well as 18 CPD points where necessary. The course consists of enthusiastic, stimulating and exciting lectures packed with updated information on every facet of spirometry. Power point lectures, questions, discussion, revision and fun quizzes are used to educate the attendees. Practical sessions on the spirometers expose the learner to the use of a spirometer under supervision and with guidance. The fast moving pace with lots of interaction and individualization makes for wide awake learners. Learner course evaluations include such comments as: “Thank you so much for a wonderful course and excellent teaching. We truly enjoyed it and came away with so much”, “I didn’t like spirometry before and avoided it as much as possible because I had no idea what I was doing, but now I enjoy doing it with confidence and understanding”. The course utilizes a combination of teaching methods including PowerPoint presentation lectures, question and answer sessions, discussion, fun quizzes and practical sessions over 3 days of which the learner is expected to attend every hour from 8-4pm. A final examination is given on the 4th day, consisting of a one and a half hour theory short and long question paper and an OSCE style practical assessment.In addition within the month after the course ends the learner is to complete a practical portfolio of evidence in the workplace consisting of 10 calibrations and 10 acceptable and repeatable spirograms done by themselves and submitted for evaluation. Upon successful completion of full attendance of the course and each of the above requirements, a Certificate of Competence in Spirometry is issued to the learner. An up-to-date spirometry manual using current South African guidelines and draft guidelines (i.e. the most current information available) is provided with everything the learner needs to know for both the written and practical assessment on Day 4 as well as to refer back to when continuing with spirometry in the workplace. 1 spirometer between every 2 to 3 students and all disposables are available for use during practical sessions. Please bring own calculators, pens and paper and wherever possible your own spirometer if it is portable together with disposables and the manual that goes with the machine. Bring any spirometry tracings that are of interest or you would like to discuss. A workshop can be arranged at any location nationally within South Africa or in other African countries for 8 students or more each time on dates suitable for learners and the facilitator. Includes a comprehensive manual, worksheets, quizzes, spirometers and disposables, exam fees, marking, one to one feedback on post course portfolio of evidence and Certificate of Competence. Refreshments throughout the day and a light lunch are included in the course fee. Fees must be received 30 days prior to the course date. Since expenses are fixed, refunds cannot be given unless written cancellation is received two weeks prior to the course. The fee is also transferable to any subsequent course within a six months period. The fee includes teas and a light lunch on each day, also beverages throughout the day, but does not include hotel or transportation costs. 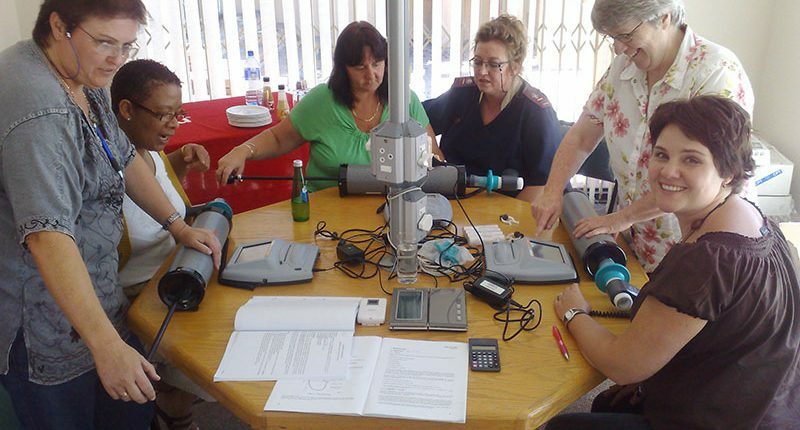 Spirometry Training Services Africa offers a range of courses and workshops, at various NQF levels, primarily in the practice of Spirometry but also in other respiratory education.